You Can Sharpen Your Focus, Improve Your Memory and Fire Up Your Brain Cells With Our Ultimate Brain Food Solution – Brain Cell Worx. Brain Cell Worx is a superior brain health formula. 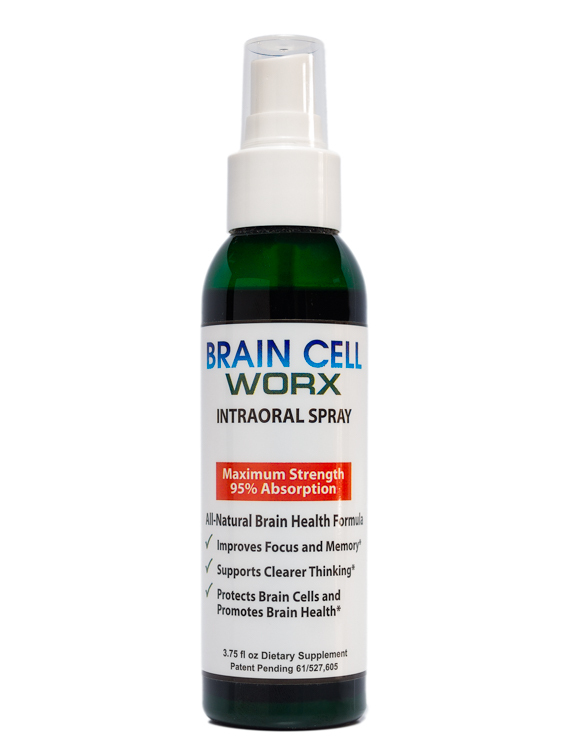 Not only does Brain Cell Worx combine ground breaking science, its pure, all natural ingredients are applied intraorally (by spraying under the tongue) as this application method ensures an absorption rate of up to 95% making it the next best thing to intravenous delivery. [Ref: Physician Desk Reference NPPDR#18]. These statements are backed by peer reviewed clinical studies. Brain Cell Worx is not a proprietary blend. You can clearly see the percentage values of each pure, natural ingredient. This supplement contains no artificial fillers or flavorings. The mild peppermint flavor is an all natural flavor. Alpha Glycerylphosphorylcholine (GPC), a form of choline is an exciting nutrient that is part of the B-complex grouped vitamins. Choline enables brain cells to communicate with each other. GPC is also very effective at increasing acetylcholine and phosphatidylcholine production. These nutrients are vital for cognitive function, protecting neurons and improving signal transmission. Ginkgo biloba (known as ginkgo or as the maidenhair tree) is a herb that has been used medicinally for thousands of years. 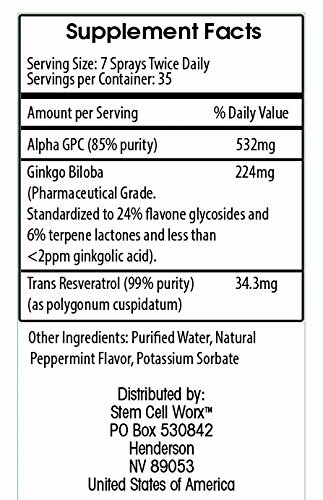 Clinical evidence shows ginkgo biloba improves blood circulation and is beneficial for managing memory loss due to brain conditions such as Alzheimer disease, and dementia (by preventing cell death). Trans-resveratrol is a powerful antioxidant that slows the aging process. Trans-resveratrol taken intraorally (sprayed under the tongue) has been scientifically proven to be 250 times more powerful than when taken in pill form. Trans resveratrol stimulates the growth of new mitochondria, it promotes anti-inflammatory relief, and promotes lean muscle and provides many benefits for the cardiovascular system and supports blood vessel health. 14 sprays per day for adults (7 sprays first thing in the morning, 7 sprays in the afternoon, early evening or 20 minutes before exercise), on an empty stomach. Spray under the tongue, hold for 5 seconds, then swallow. Once opened best stored in the refrigerator. Must be kept out of direct sunlight and heat. • if you are pregnant, planning to become pregnant, or breast-feeding. • if you are taking any prescription medicine (always check with your Doctor). • if you have allergies to medicines, foods, or other substances. • If you have chronic kidney failure. • if you have a history of blood disorders, bleeding conditions or low blood pressure. • If you are under 18 years of age.